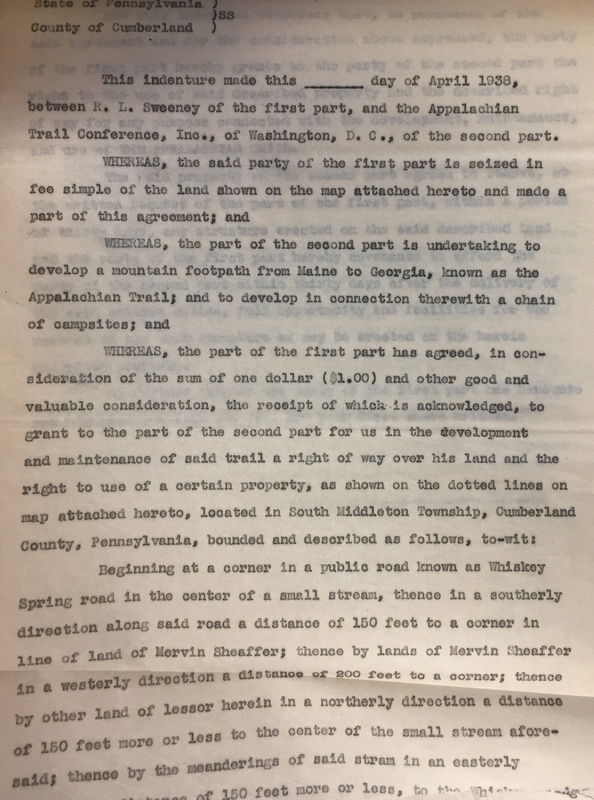 When the leaders of the Appalachian Trail Conference (ATC) declared the Trail complete at their meeting in Gatlinburg, Tennessee in 1937, they understood that the route of their Trail was anything but secure. More than 60 percent of the Trail passed through private lands, largely as a result of a web of formal easements or handshake agreements between local trail clubs and landowners. These agreements, like the one picutred here, depended entirely on the goodwill of both parties and thus could be, and sometimes were, canceled or revised at a moment's notice. Anywhere along the Trail, property owners could suddenly decide they no longer wanted hikers tramping across their land, they might sell to a developer that intended to build vacation homes, a ski resort, or as happened on Mount Oglethorpe in Georgia, a very large chicken farm. The fragile nature of these arrangements meant that the Trail had to be rerouted constantly in response to changes in rights of way along its path. Thus, leaders of the Appalachian Trail community undertook efforts to secure the future of the Trail, first by lobbying the U.S. Forest Service and the National Park Service to grant the Trail a buffer zone on either side of its treadway in the lands they controlled. This effort, which began at the 1937 meeting of the ATC, resulted the following year in the "Appalachian Trailway Agreement," which provided for a protected strip of land 100 yards on either side of the Trail where it passed through federal government lands, and assistance from the Park and Forest Services in the construction of shelters along the Trail in their lands. In the aftermath of the Second World War, Trail supporters began to seek federal funding for the purchase of private lands along the Trail's route. Early attempts to secure such funding failed, but in the early 1960s the ATC and its member clubs began a more coordinated effort to secure federalization of the Appalachian Trail. 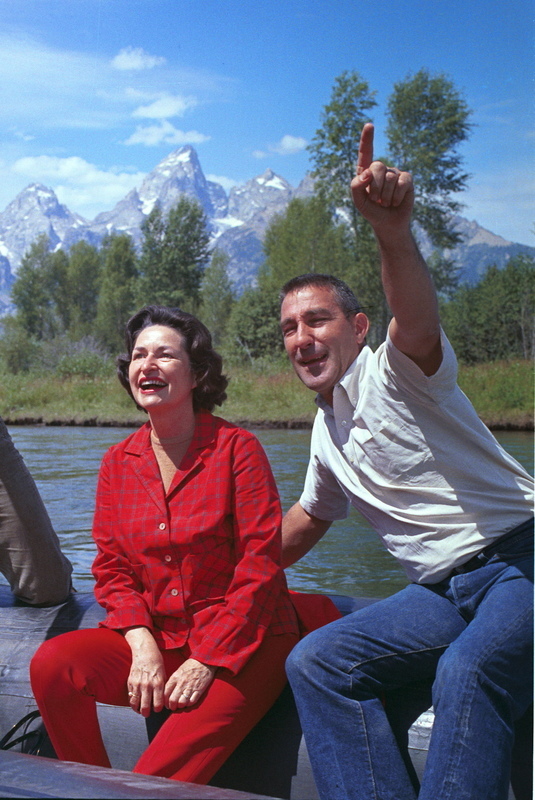 These efforts were a response to growing development pressures along the Trail's route and signs of restiveness among landowners who had granted easements for the Trail, in part as a result of the growing numbers of hikers in the 1960s. Where once just a few hikers each week might pass across someone's property, by the mid-1960s the number of hikers, especially in the most popular sections of the Trail, had grown substantially. And those hikers were often guilty of leaving large quantities of trash behind, lighting fires where no right to do so had been granted, or camping in areas that the landowner had understood to be off limits. By the mid-1960s, securing federalization of the Appalachian Trail had become the single most important activity of the ATC. Leaders of the Conference, as well as leading members of a number of the local trail clubs, lobbied Congress and the Secretary of the Interior Stewart Udall, seeking protected status for the AT. 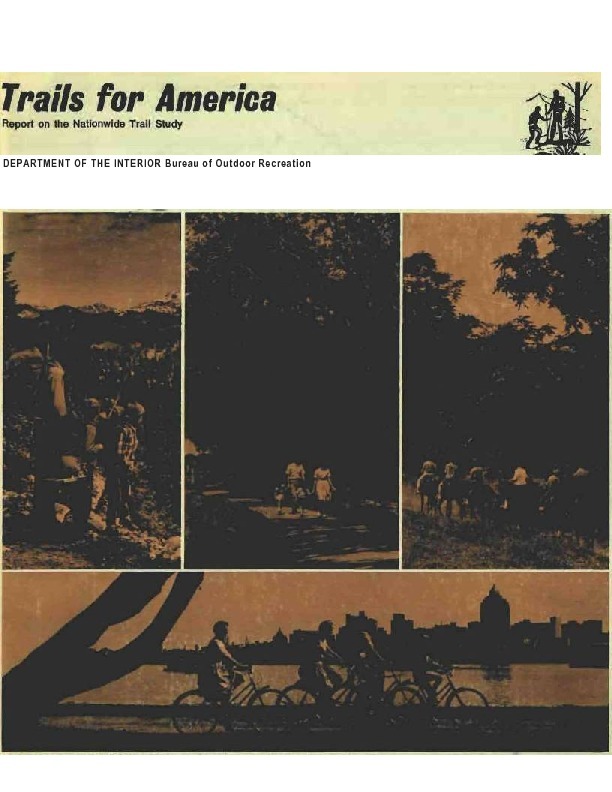 The result of these efforts was the National Trails System Act of 1968, which designated the Appalachian Trail and the Pacific Crest Trail as "national scenic trails" and incorporated the AT into the National Park system. The new law also created a "Appalachian Trail Scenic Advisory Council" that gave the ATC and its member clubs a voice in the administration of the Trail by the Department of the Interior. Ever since, the Appalachian Trail has functioned as a unique public/private partnership between the Park Service and the ATC.